We don’t like to crow about it here in the North-East, but not a lot of people know that it was two brothers from West Stanley, Co.Durham, who founded the Hollywood movie business on America’s west coast. That’s not to say it wouldn’t have happened without them, but David & William Horsley were most certainly the very first businessmen to set up a film studio in the famous suburb of Los Angeles. History seems to place David, the younger of the siblings, as the driving force behind the extraordinary venture. Born in 1873 at West Stanley, then a bustling little pit village in the heart of Durham, he seemed destined to follow his family members into the lifestyle to which they had become accustomed – until two significant events changed the course of his young life. Firstly, aged nine, his hand was crushed under the wheel of a train, necessitating the amputation of his lower arm; then, in 1884, the family emigrated to New Jersey in search of a better life. As he entered adulthood, the disabled David set up a bicycle business and ran a pool hall. In time, he fell in with a former Biograph Studios employee, Charles Gorman, and the two of them – together with brother William – decided to set up the Centaur Film Company in 1907. By 1910, they were turning out a handful of films per week, including the famous Mutt & Jeff comedies. In order to really make an impression in the industry, though, they needed reliable sunlight – and the west coast was the place they targeted. So, in the summer of 1911, their set-up was moved to California, and the name changed to the Nestor Motion Picture Company. Though a handful of film companies were already operating in the area, the Horsleys’ studio was the first to be established in the LA suburb of Hollywood. The very first movie set was erected in the backyard of the Blondeau Tavern Building on Sunset Boulevard – and in late October 1911 the first short Hollywood film was shot. LA operations were, in the main, entrusted to the Horsleys’ general manager, Al Christie, whilst the brothers ran the film processing and distribution side of the business from their New Jersey base. 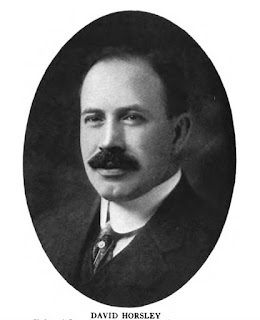 However, things moved fast, and as other companies arrived in Hollywood in their droves, the Horsleys decided to merge with several other concerns and form the famous Universal Studios in April 1912 – with David listed as among the new company’s founders. Within a year or so, however, he had sold his share in the new organisation and embarked on a life of travel. He returned to the film industry a few years later, but his venture failed, and he eventually died – and was buried – in LA in 1933. William Horsley also left Universal (in 1916) to concentrate on the processing and developing side of the business. Interestingly, David’s son, David Stanley Horsley, became a movie special effects expert. In the days before Sky and Virgin Media, a healthy majority of TV aerials in the North-East pointed squarely towards the famous Pontop Pike transmitting station, near Dipton, Co.Durham. It is a largely unloved regional landmark, but it is responsible for enlivening and enriching all our lives these past several decades – and it has one or two notable historical facts linked to it, too. The mast isn’t difficult to spot at 149m (489ft) in height, being visible for tens of miles in every direction. It was built in something of a hurry in 1953 so that we could all gawp at Her Royal Highness during her coronation. The very first TV programmes were transmitted via the station on 1st May, and the royal extravaganza followed a month later. Initially, we had to put up with substandard black and white VHF signals, but this was joined by UHF colour in 1966. It has, of course, also carried radio signals – most notably being one of the UK’s first FM transmitting stations in 1955. Its lengthy period of service continues to this day with digital services, though it formed part of the last-but-one transmitter group in the UK to shake off the old analogue service and complete the digital switchover in autumn 2012 (Northern Ireland was the last). It remains the main broadcasting transmitter in the North-East of England, covering Tyne & Wear, Co.Durham, Tees Valley, most of Northumberland and even extends into parts of North Yorkshire – with a population coverage of around 2 million. Your first evening offered first class entertainment. The visit to the Severn Wildfowl Trust Sanctuary must have been delightful to nature lovers and was excellently produced, the close shots of the birds being particularly fine. The Boys Brigade display from The Royal Albert Hall, London, was another good outside broadcast, and had an efficiency worthy of Horse Guards Parade. The programme "In The News" is usually well worthy of attention; last night's discussion of the M.I.G. reward offer was given many interesting angles. "Kaleidoscope" is a show for the family. It aims only to please, and while it does not always do that, it did so last night after having had an overhaul. The short play-story however, was rather childish. Note: In case you’re wondering, the nearby Burnhope transmitter was originally an ITA/ITV effort, and has, generally speaking, relayed commercial TV and radio signals since its construction in 1958. 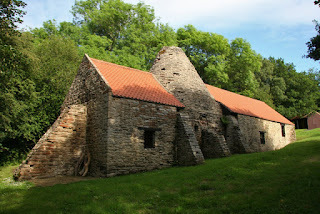 Close by the banks of the River Derwent near the village of Hamsterley Mill can be found a rather important relic of the Industrial Revolution: the Derwentcote Steel Furnace. It is the oldest and best example of its type remaining in the world – a cementation furnace which turned wrought iron into high grade steel. Of the remains that can be seen today on the site, the oldest parts date to at least as early as 1719; and the plant remained in use until 1891 when a more advanced form of steel production was developed. As for Derwentcote, it began as a forge (and mill) around 1719, with the furnace added c.1733. Various storage buildings were then added as the complex hit full pelt. Iron would be imported from Sweden, via the Derwent, and handy local resources (charcoal, coal, clay and sandstone) made it a perfect spot for its intended purpose. The cementation process involved layering bands of iron bars and charcoal powder in the central cone. A fire was lit and the temperature raised to about 1,100°C in the sealed chambers, causing the carbon from the charcoal to diffuse into the iron. The whole process – including the cooling period – took three weeks, and produced 10 tons of ‘blister’ steel. The steel was then taken to the water-powered forge to be made into items such as tools – steel, of course, being preferable to iron due to its combined strength and flexibility. For a time Derwentcote and the Derwent Valley were the epicentre of the British steel industry, but progress eventually overtook it. After it fell out of use the building endured a century of slow decline – until English Heritage restored it in 1990. Currently an archaeological programme of investigation is examining a nearby row of ruinous cottages thought to have been occupied by the families of the furnace workers. The mighty Colin Milburn is perhaps the biggest name to come out of Burnopfield – in more ways than one. At 18 stone, his size was both the making of him and, perhaps, his downfall. One thing’s for sure: he was a supremely talented cricketer, appearing in a ludicrously paltry nine test matches for England. 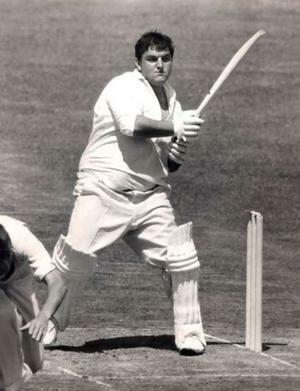 ‘Ollie’ was born in October 1941, and followed his sportingly talented father into cricket at an early age. He played in local leagues, before progressing into the Durham team (who were then a minor county) at 17 – and scored what was described as a ‘dynamic century’ against the touring Indians at Sunderland in 1959. By the summer of 1960 he was playing for Northamptonshire at first-class level, with his forceful batting, useful bowling and famous convivial personality. He was mooted several times for an England call up during the early ‘60s, but had to wait until 1966 for his international debut against the West Indies. A promising series (including scores of 94 and 126 not out) ended in disappointment when he was dropped for the final test, supposedly due to his lack of mobility in the field. It was not the last time he would be messed about by the selectors. After being voted one of Wisden’s ‘Cricketers of the Year’ in 1967, he spent a varied few years playing across the globe – including Sheffield Shield cricket in Australia, where he excelled, once scoring an incredible 181 in a two-hour session. Unable to ignore his obvious talents, he was given the chance of the occasional additional test match during the late 60’s – against India, Pakistan and Australia. He scored a memorable 83 against the latter at Lords in 1968, and a spectacular 139 at Karachi against Pakistan in the Spring of 1969. This innings would be his last for England. The 1969 season opened with another Milburn century for Northants, but on the way home he was involved in a car accident which robbed him of the sight in his left eye and damaged his right. He battled on in the months and years ahead – including a comeback of sorts during 1973-74 – but never recaptured his former glories. He moved back down into league cricket and commentated on the game, before a fatal heart attack took him from us at the age of 48 in 1990. He was buried in Burnopfield.